I think that this makes for a pretty concrete definition. Instead of having a physical computer in the room that is doing the “thinking” the, “thinking” is done on a computer in another location – that location is known as the Cloud. The connection from your location to the Cloud is via the internet. There are many different types of Cloud Computing and the chances are that you are already using some of them without realising. Do you save your files to a Google Drive? What about Apple’s iCloud to share your photos? Do you access Outlook 365 email via the web? Do you calculate and file your tax return using a website? Do you use a Chromebook? Congratulations, you are embracing and using Cloud Computing. Cloud Computing comes in all shapes and sizes but really all types of Cloud Computing fall into three categories, Storage, Processing and Applications. You may then see these complicated sounding acronyms associated with these three categories IaaS (Infrastructure-as-a-Service), PaaS (Platform-as-a-Service), SaaS (Software-as-a-Service). These all sound a lot more complicated than they actually are. Why do I need Cloud Computing and what are the benefits? Put simply, Cloud Computing lets you do things with your computer and devices that are not possible on their own. Let’s look again at the three types of Cloud Computing we defined earlier. Storage; Cloud Computing lets you backup your photos from your iPhone. Cloud Computing lets you save 50gb of files to a Cloud Storage System when you only have a 10gb Hard Disk on your laptop. Cloud Computing then lets you share these files across multiple devices without having to physically connect to a storage device like a Hard Disk or a USB Thumb Drive. Processing; Cloud Computing lets you run applications that you don’t have to install on your computer. Cloud Computing lets you run Applications on devices such as Chromebooks purely through the internet. Look at what Google are doing with Sheets, Docs & Slides – all browser based. Cloud Computing let’s you run applications that are perhaps too “heavy” (require too much processing power) for your own computer that may be several years old. Applications; Cloud Computing allows us to build and run applications that are cross platform compliant (so they can all run on Windows, MAC and Chrome for example) directly from our own browsers. See what TouchIT Technologies has done in this instance later on in the book when we look at Contribute Cloud. Cloud Computing lets you run applications that you don’t have to install, update or maintain. You don’t need to worry about compatibility as they run in a web browser most of the time. 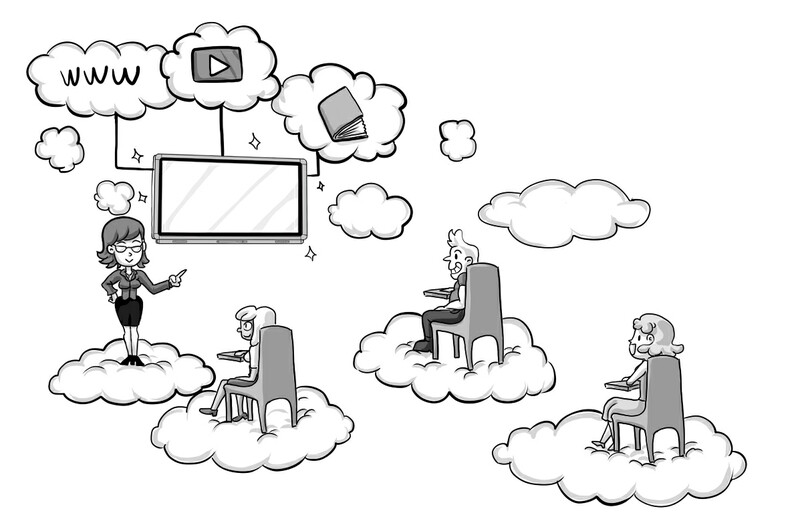 Cloud Computing has never been more relevant to the Classroom than today. Not all School Districts and in my experience, very few have the budgets from the latest Apple Macs or powerful Windows PCs. Most Districts have a 3-5 year replacement policy and can afford middle of the road technology at best. So could be on 5 year aged “middle of the road” hardware. Technology changes so quickly so I want to show that these 5 year old, slow, under powered machines can utilise Cloud Computing to put some life back into them. I also want to show how using Cloud Computing in the Classroom can revolutionise the way that Teachers teach. To demonstrate this, what I am going to do is look at 5 Cloud Computing Services that I think you should not be without in the classroom. We’ll look at how we can use them, what we can do with them. Then, we will also look at the cost and TCO (Total Cost of Ownership) of each and what you need to do to get up and running. I’m not affiliated in any way to Google, and personally I use more Apple products than Google. That said, you will see that most of my examples below involve Google either directly or indirectly. I think this is just a real indication of Google’s push into the Education market and Cloud Computing whereas the likes of Microsoft one could argue has continued to target the Corporate World and Apple is more the home user with its iPads and Corporate with its MACs. I’m sure many will refute my comments here as Apple do have many iPad initiatives into education and Microsoft has launched a Windows 10 targeted specifically at Education. That said, here are my 5 “Must Haves” for the Modern Classroom in the Cloud. Whilst it may to some seem a little self indulgent to be including my own company’s software, Contribute Cloud warrants its place on the list and lets have a look why. Contribute Cloud is a revolutionary lesson creation, whole class distribution, and whole class collaboration platform. A bit of a mouthful perhaps, but that is exactly what it does. Today’s lessons are no longer “just a piece of paper” or a “worksheet” handed out to a class. They comprise of multiple digital sources of content and that is where Contribute Cloud comes into play. Rather than having to open several applications all at once and switch between them, you can now bring all your files into one place. Creating a lesson that contains images, documents, video, YouTube, Excel etc etc is now just a case of logging into your Free Contribute Cloud account. You can login with your email address and a password that you choose, or, you can login via social media. Once inside the platform, you are presented with two options. Create a new lesson, or open an existing one. The idea of Contribute Cloud is to be as functional as possible but keeping it really simple so that it is useable and accessible to all. If we choose to create a new lesson, we’re promoted to give the Workbook a name, a subject and we can enter a description. We’re then presented with a clean user interface inviting us to drag and drop different file types into the workbook from either our local computer, or our cloud storage drives. Having access to the popular Cloud Storage Drives such as Google Drive, DropBox, OneDrive means that we can make use of even more Cloud Computing power. Select your drive and login. You can then have access to your files and make a selection of the multiple file types that you want to include in this particular lesson. Drag and Drop them and slides form on the right hand side which can be reordered later. Before we continue to create our lesson, we are going to add some students to our account so that we can share the lesson with them on their devices once it is complete. There are a couple of ways that we can do this. Either manually, by typing their name and their email address, or, if you are a Google Classroom user, you can link directly to your account and import your class lists. This is particulate helpful as if your school or district has any reasonable number of Chromebooks deployed, the chances are that you are using Google Classroom or Google Apps for Education (GAFE). There is no recreation required, just one click and a login to your Google Account and your Class Lists will populate in Contribute Cloud. Once we have created our lesson, it is time to present it to the class. What we are doing with Contribute Cloud is providing a whole class teaching environment, that is Cloud Based and uses the power of Cloud Computing to deliver our lesson to the students on their devices. They can then request access to the annotation tools to be able to collaborate together. What Contribute Cloud does is fill the “gap” left open by Google for the whole Class teaching utilising a front of class LED display. Google Classroom is great for one-to-one lesson delivery, student completion and return back for marking by the teacher, but what it does not do is give you a whole class collaboration environment that Contribute Cloud does. Clicking on the Add Students button in Contribute Cloud brings up your class lists. You then need to select you class and then a email is delivered instantly to all your students. Simply click on the “join button” and your students will now see what is being displayed on the LED on their own device. By Device it can be PC, MAC, Tablet, Cell Phone, Chromebook in fact anything that runs a web browser. Contribute Cloud also goes one step further and via “Contribute Chat” you can deliver messages and links to your students that are connected to the session. If you use “Contribute Video” you can either stream your webcam and audio which means that your students don’t necessarily need to be in the same room as you. This opens up the possibility of distance learning or even one to one coaching through the software. The ‘Piece de resistance’ of Contribute Cloud is the Contribute Cast feature. What this enables you to do is bring your students screen up onto the LED – just like Chrome Casting without the need for additional software on hardware dongle. You can view multiple students screens at one time and even allow the student to cast in full screen mode on the LED to show their presentation or work. You may think that software such as this is going to cost the Earth. Quite the contrary, Contribute Cloud from TouchIT Technologies is Free to use and will always be free for TouchIT customers. Why don’t you head over to http://contribute.cloud and create your free account today. From creating an account to Contribute Casting in your classroom is not a steep learning curve. At TouchIT Technologies, we do simple well.